The term one-to-one relationships refers to relationships of two items in which one can only belong with the other. They are a pair. These relationships can be referred to in a mathematical sense as well, in which there are equal numbers of items. In math, the ability of a student to identify the number one as corresponding to one item, the number two as corresponding to two items, the number three as corresponding to three items is an example of one to one relationships known as "one-to-one correspondence." One employee belongs to one organization. One dog belongs to one person (or one family). One person has one passport. A car model is made by one company. A house building prototype belongs to one company. A pair of jeans has one brand name. A book is published by one company. A software program is made by one organization. 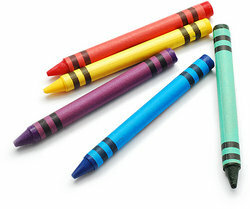 A type of crayon is made by one brand. A purse is manufactured by one designer. A wine such as Albarino is made from one specific grape. An apple comes from one source (a tree). A shark lives in one place (the ocean). A specific tree grows in one climate, such as a palm tree in a warm climate. A shoe has one place on which you would wear it (your foot). An animal has one type of preferred shelter. Santa Claus is associated with one holiday. A glove has one place on which it would be worn (your hand). A person has one driver's license. The brakes on the car have one purpose. Wood comes from one source. Water has one chemical makeup. Bees have one type of home. Clouds have one way of being formed. Fire has one way of being made. Leather comes from one specific source. Amoeba have one way of reproducing. The appendix had one function. Grapes come from one source of vines. A dress has one designer. A chicken egg has one source. Gas has one function when put in a car. A person has one General Practitioner. A house belongs to one set of residents. The Easter Bunny is associated with one holiday. The Tooth Fairy is associate with one purpose. The letters B, D, F, H, J, K, L, M, N, P, Q, R, S, T, V, W, X, and Z all have only one sound each in the English language. The digraphs sh, ch, wh, and th each are associated with only one sound in English. Soap is associated with one purpose (to clean). The diphthongs ou, ow, and au are each associate with only one sound in English. An x-ray is associated with the one function of taking internal pictures. Now you have seen lots of different examples of one-to-one relationships and you can better understand how these relationships work. "One-to-One Relationship Examples." YourDictionary, n.d. Web. 23 April 2019. <https://examples.yourdictionary.com/one-to-one-relationship-examples.html>.